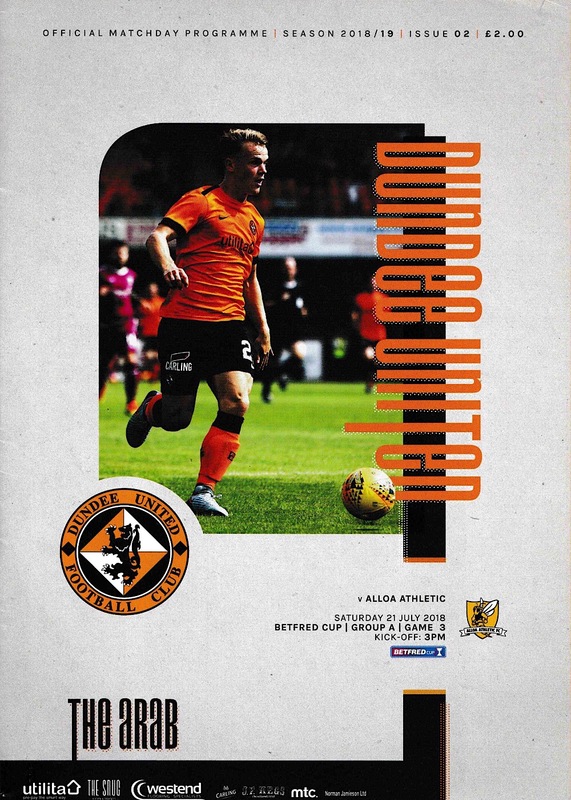 United’s elimination from this year’s Betfred Cup was confirmed after a penalty defeat to Alloa Athletic at Tannadice. The match was depressingly similar to the preceding week’s penalty defeat against Arbroath, with United taking the lead, being pegged back by a late penalty, before losing in a penalty shoot-out. 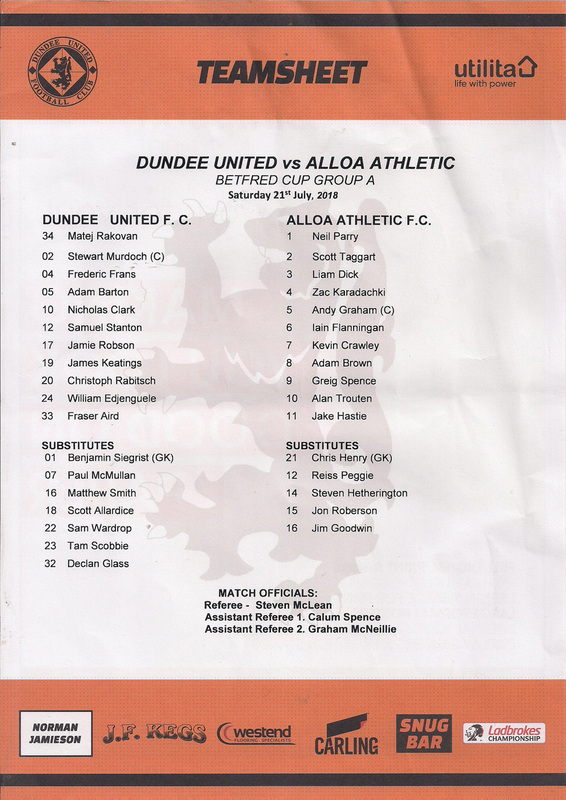 There were four changes to the team which had lost 1-0 to Ross County in United’s previous game. Jamie Robson, William Edjenguele, James Keatings and Fraser Aird all returned to the starting line-up with Callum Booth, Paul McMullan, Sam Wardrop and Matty Smith all dropping out. In front of a disappointing attendance of 1659, United’s lowest home crowd for a competitive game since 1974, it was a nervy start to the game, and it was the away side who initially looked the stronger of the two teams. 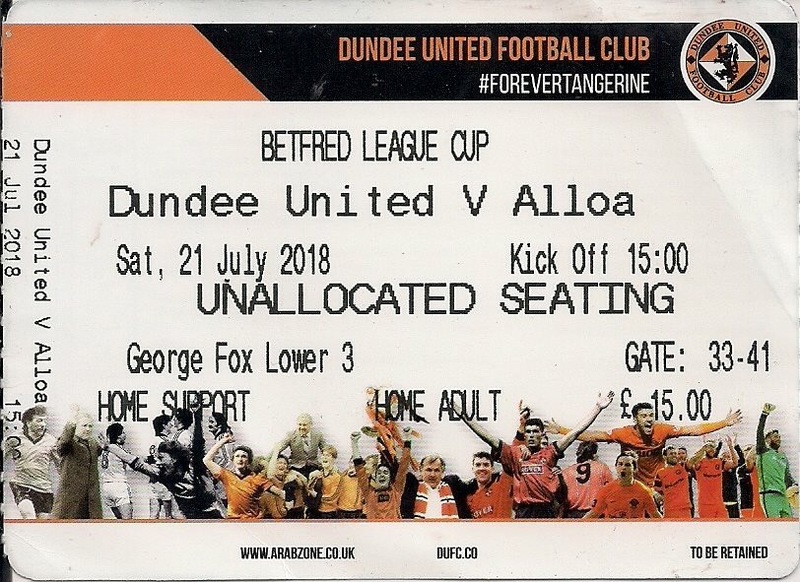 Despite losing both games, Alloa had caused United problems in the two cup games between the teams last season, and they were continuing to do so here. However, United did create the first chance after six minutes, when a wonderful low cross by Sam Stanton was almost tapped into the net by James Keatings, although the striker could not quite get onto the end of the pass when any contact would surely have given United the lead. The away side had a chance of their own soon afterwards when Greig Spence met a flick on from Kevin Cawley but the former Raith Rovers striker’s effort hit the side netting. After 16 minutes, Keatings again almost met a through ball from Sam Stanton, although as before the ball was just out of his reach and the chance was gone. Two minutes later, Nicky Clark won a free kick after he made a driving run through the middle of the Alloa defence. James Keatings took the free kick but his shot was hit well over the bar. After 20 minutes of play United had a great chance to take the lead when a Jamie Robson cross was met by Nicky Clark, but the former Dunfermline striker’s header smashed off the bar. Alloa goalkeeper Neil Parry did brilliantly to block the follow-up from James Keatings. Fraser Aird had a shot blocked a minute later as United finally began to create chances. William Edjenguele could only head over from the corner kick. A couple of minutes later, Frederick Frans became the latest United player to be foiled by Parry as the Belgian defender saw his header saved by the increasingly impressive Alloa goalkeeper. From the resultant corner, they took the lead as Frederic Frans bulleted a header past the helpless Neil Parry. Alloa responded to that setback very well and saw a lot of the ball in the remainder of the first half, although they were unable to cause the United defence any problems. Aside from a half chance on the 30-minute mark when Sam Stanton flicked a Stewart Murdoch cross just past the post with his heel, there were no chances created at either end until just before half time when a James Keatings strike from the edge of the area was saved well by Parry. Declan Glass came on at half time for Christophe Rabitsch, who had looked rather tentative after an early booking. Having the talented youngster on the field seemed to give United a boost, and Glass was unlucky not to double Unite's lead five minutes into the half but Neil Parry just beat him to the ball after he had been played through on goal. A minute later, Nicky Clark was played through on goal but again Parry was able to intercept the ball before the United player could capitalise. At the other end, Jake Hastie and Greig Spence were causing the United defence all manner of problems. Just before the hour mark a great turn and pass from Hastie inside the box saw the ball land at Spence’s feet, but Matej Rakovan in the United goal did well to turn the ball past the post. United were seeing a lot of the ball themselves, but most moves were breaking down on the edge of the Alloa penalty area. With fifteen minutes left United had another chance to get a second goal, and again the impressive Declan Glass was at the heart of it. The United youngster created some space for himself at the edge of the box and hit a lovely right foot shot that Neil Parry did well to block. The ball rebounded to Paul McMullan on the angle who hit a first time shot into the side netting. Within 60 seconds, Alloa were handed a way back into the game as United conceded a late penalty for the second home game in a row. Adam Barton was caught in possession on the edge of the area by Jake Hastie, and the Alloa player's run in the box was crudely halted by Frederick Frans. Alan Trouten firmly converted the penalty, and although Matej Rakovan dived the right way the shot had enough pace to beat him. United were lucky not to concede a penalty two minutes after that when Stewart Murdoch brought down Hastie right on the edge of the box. A free kick was awarded but the chance was wasted. United did not heed that let off and the away side nearly took the lead a minute later when Greig Spence has a shot cleared off the line by Paul McMullan, and soon after that Iain Flannigan raced clear and managed to get a shot away after attempting to round Matej Rakovan, but luckily for United, the keeper managed to get something on the ball as the shot squirmed past him. This slowed the shot down enough for Frederick Frans to get back and clear the ball off the line. The game ended level and so for the second time in three Betfred Cup games, United had to face a penalty shoot-out. It started badly when Stewart Murdoch saw his kick saved by Neil Parry. The next seven penalties were all scored, with Scott Taggart, Greig Spence, Iain Flannigan and Alan Trouten all successful for Alloa and Fraser Aird, Adam Barton and Declan Glass all scoring for United. It meant that Paul McMullan had to score to keep United in it and he failed to do so, his penalty kick being saved by Neil Parry. 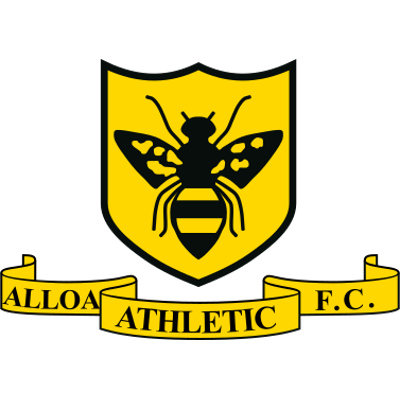 The save gave Alloa a 4-3 win on penalties and the bonus point and left United languishing in fourth place in the group with a mere two points from three games and only a dead rubber against Elgin City to come. From what I saw on Tuesday, with Adam Barton, Christoph Rabitsch and Sam Stanton, we have a very strong midfield. At the back, Frederic Frans was very strong and organises the defence fantastically well. Behind him goalkeeper Matej Rakovan was strong presents huge competition with Ben Siegrist for that area. Only the result was disappointing, but that wasn't so bad against a Ross County side that could be our biggest competitor in the league. Certainly, there were many aspects from which we can take some pride. Indeed, it reminded we of the game at St Mirren last season when we also missed a penalty and the possibility to go ahead. But this time was even more disappointing given how late the game we had the opportunity to win the game. It is part of the learning process of this new team. In our first pre-season game at Brechin, wse weren't so fantastic and in the second game against Raith Rovers, I saw a lot of problems. Whereas against Ross County, compared to last week's game with Arbroath, there was considerable improvement. We looked like a team and were very good in many areas, but we must concentrate more. Whilst moving out of the group stages of the League Cup was our aim, our target is getting promotion and today's game against Alloa gives us anther chance to build on the progress made and I am sure that the supporters who were up at Dingwall showed their appreciation of our efforts by applauding the team despite the defeat. And I hope the relationship between the team and the fans wilt develop as we look to achieve what we all want and that is promotion.